Few holidays shows are as inspiring as Carols in Color, a Holiday Dance Music Celebration, performed in Wilmington by Eleone Dance Theatre and presented by Christina Cultural Arts Center and Revive the Village. For 22 years, the show, a spectacular telling of the Biblical Christmas story with an African American Gospel flavor, has graced area stages. Whether the show is performed in a high school auditorium or a big proscenium theater, it always delivers. This year, the Wilmington show was performed at The Grand Opera House downtown to a packed room, including many local children and families, some of whom were gifted with tickets through CCAC. That generosity is part of Eleone Dance Theatre Artistic Director Shawn-Lamere Williams' mission. "We must invest in our children," he said after the show. "There's a saying, 'It Takes a Village to Raise a Child.' Today it takes a World to Raise a Child." Funds raised from Carols in Color and its sponsors, including United Way of Delaware, Delaware Division of the Arts, AstraZeneca, Black Heritage Education & Theatre Group, Center Wilmington Early Learning Readiness Team, and Delaware Office of Early Learning, help to support Christina Cultural Arts Center Education Programs. 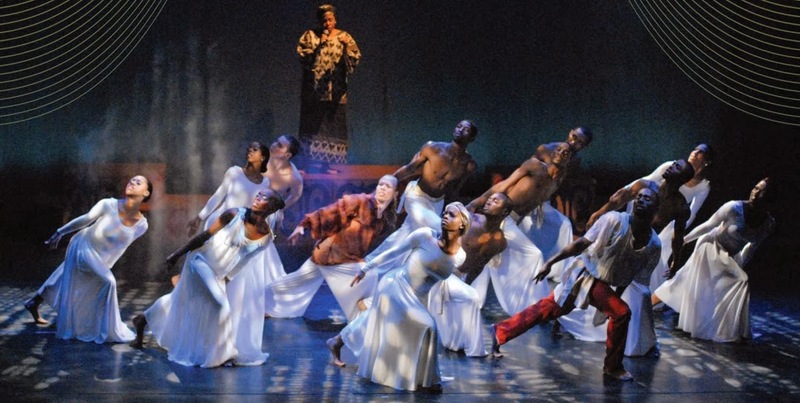 For the uninitiated, Carols in Color is an original production of the Eleone Dance Company in Philadelphia, conceived by the company's founder, E. Leon Evans, II. It combines modern dance and a live Gospel chorus, as well as music from various gospel artists, to tell the Christmas story starting from Gabriel's first visit Mart?. Several local students of Christina Cultural Arts Center? also participate in the show. The first act of Carols in Color focuses on the confusion, helplessness and hardship Mary and Joseph faced as they dealt with her very unexpected pregnancy. Most of the first act is comprised of beautiful solo dances -- performed this year by Anthony Rhodes as Gabriel, Dara J. Meredith as Mary, Matthew Thomas as Joseph and A'aliyah Khan as the Angel of God -- with their voices sung by Jeremy Isaac, Tina Finks/Germaine Downing, Kairi Guinn and Tia McNeil, respectively. Songs include "What Shall I Do," "Bridge Over Troubled Waters" and "No Place To Go." The second act opens with "Go Tell It On The Mountain," as Mary presents the baby Jesus, played by little Dakota Meredith. The celebration continues with "Hallelujah" from Handel's Messiah: A Soulful Celebration, "The First Noel," "Silent Night," with "Angels We Have Heard On High" finishing the show with the entire cast of dancers and singers on stage. If you missed this year's celebration, be sure to catch it next year, when the company will continue the tradition for the 23rd year. For more information on how to support Christina Cultural Arts Center and Carols in Color, go to ccacde.org and eleonedance.org. Christmas is a time for establishing Christmas traditions that can be passed from generation to generation. This helps children have a feeling of belonging and gives them lifelong memories. It is genuinely a that'll never achieve the ocean When not here with me, when more what's more relinquished and implored.